Issue 3: Sight | Nanooze! Issue #3 is the first of a three part series on the Five Senses and what is “nano” about them. The sense of Sight is so important it gets an entire issue of its own. (see issue #4 and Issue #5 for the other senses). Each of our senses allows us to experience our surroundings in very different ways. A hot summer day can engage all the senses as we feel the heat, wear sunglasses against the brightness, smell the hot asphalt, and hear the ice-cream vendor coming with the promise of a refreshingly tasty treat. Or a winter day can thrill with the sight of a beautiful snow-covered wonderland, but serve up a vicious bite when we feel the blast of freezing wind. We have lots of different kinds of cells in our body. Some of these cells help with our different senses and each sense involves a special kind of cell. Cells inside our eyes detect photons of light, while tiny, delicate parts of our ears sense the different vibrations of sound waves. All those cells are hooked up to our central nervous system, which relays the signals triggered by those special cells to our brain where they’re processed into a response. It may sound simple—touch an ice cube and your brain tells you is “it’s cold”—but it involves a lot of specialized cells and a complex transfer system to transmit signals to the brain. Then once the signal arrives, your brain needs to figure out what’s going on and give you the right picture, sound, smell, taste or feeling. And it all happens at lightning speed! 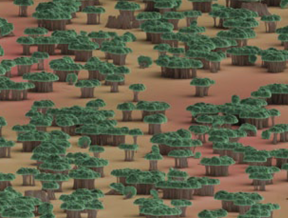 Scientists study our five senses to learn more about how these complex systems work, so nanotechnology helps shed new light on what’s really happening in the tiniest parts of our bodies and can help us develop new tools that can sense like our bodies do. 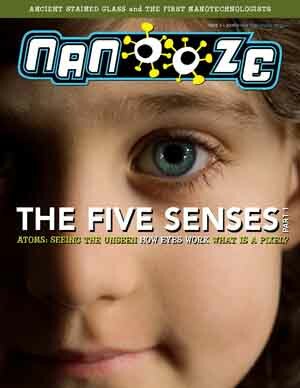 As always, you may request free classroom packs (multiples of 30) of any available issue of Nanooze. They are distributed free of charge to US public and private schools, as well as selected university and museum programs.